Morales is a municipality located in the Bolívar Department. It was founded on 14 September 1610 by Don Pedro Vicente de Morales. The flag of Morales is shown in the municipal web site. "The flag of the municipality of Morales is of dimension 1.5 m x 1 m. It is made of two main stripes placed horizontally, green and blue, representing, like on the shield, the two contrasted geographic regions forming the municipal territory: a higher, montainous region [green] and a lower region including a network of marshes and banks [blue]. A yellow isosceles triangle is placed along the hoist, charged with the municipal shield. From the triangle emerges a thin yellow stripe with a red fimbriation separating the two horizontal stripes from each other and from the triangle sides. Yellow represents the gold resources and the promising future of this glorious region, while red is a posthumous tribute to the nobleness and heroism of our countrymen who fought in the so-called Battle of the Bishops." "The shield is a simple Polish shape, 6 x 6, quartered. The first quarter, green, represents the splendor of the higher, mountainous region and the fertility of its soil. The second quarter, yellow, is charged with the elements characteristic of mining [a shovel and a peak crossed per saltire and surmonted by a helmet, all white], as the maximal expression of our resources. The third quarter, yellow, is charged with four red stars placed in each of the four main compass directions, representing kindness to our visitors and the four historical territories merged to form the municipality, Morales, Río Viejo, Regidor and Arenal. The fourth quarter, blue, represents the lower, marshy region and its water resources. 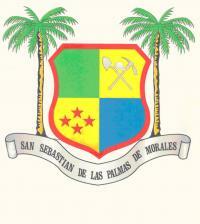 The shield is flanked by two palm trees, recalling the founding name of the place, "San Sebastián de las Palmas de Morales", which is also written in black letters on a silver wavy scroll from which the palm trees emerge." The image of the shield shown on the municipal website points to a high-resolution image. Gold mining takes place in the "corregimiento" of Mina Gallo, located in the massif of San Lucas. Neighbouring the municipality of Santa Rosa del Sur, this region is characterized by a high level of violence. Therefore, there is little control of gold mining and the local water resources, such as the sources of Arenal and Honda are highly contaminated with pollutants such as mercury cyanide.